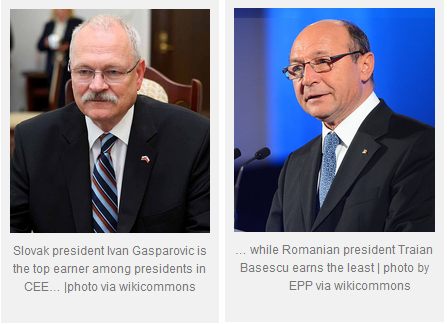 Presidents and Paupers II: How much do CEE presidents earn? For this post I collected data on presidential salaries including lump sums that are paid on a monthly basis without being designated for a specific function. The numbers presented below are however exclusive of benefits such as housing, allowances for hiring personal staff, use of cars/planes etc. The former type of benefits varies greatly between countries and these benefits are very difficult to compare (especially when one also includes allowances for spouses). However, one can say that in general those presidents who earn more also receive more additional benefits. Unfortunately, this does not apply to pensions. All data – except salary of Czech president Zeman – relates to the last quarter of 2012. The bar chart shows that in absolute terms Slovak president Ivan Gasparovic is the top earner among the Central and East European presidents. With currently € 9,172 per month Gasparovic receives almost six times more than his Romanian counterpart Traian Basescu (who earns a meagre € 1,529). Even though the differences in the national gross average monthly income are not as large, they are still visible. Slovenia is front-runner with € 1,546 while Bulgaria trails behind with less than a quarter (€ 384). 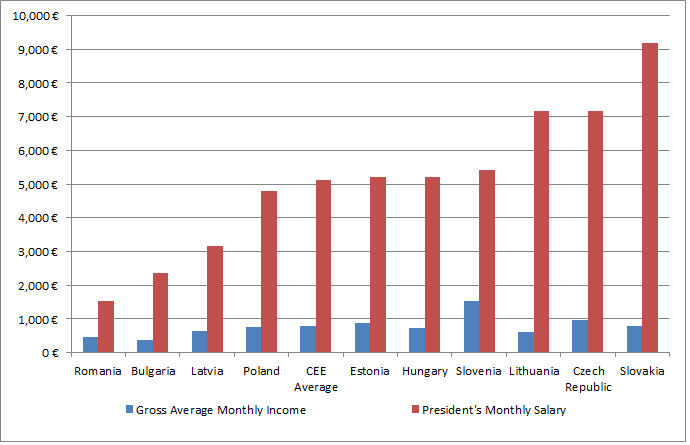 The average presidential monthly salary is € 5,118, the gross average monthly income in Central and Eastern Europe is € 776. 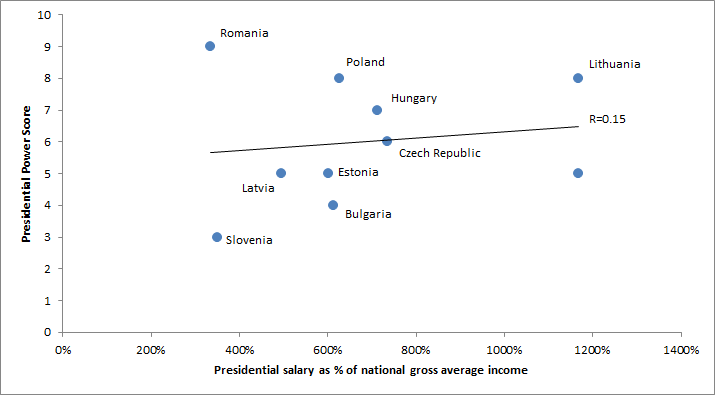 When setting presidential salaries in perspective, the national average income is obviously the best reference value. 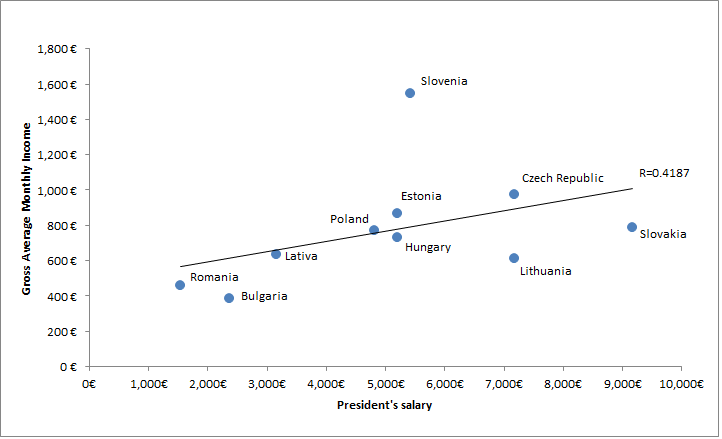 When ranking presidential salaries as % of the national average income the order changes (although only the Slovenian and the Bulgarian president jump several places). Front-runner is once again Slovak president Ivan Gasparovic who earns 1167% of the national average income (although he now has to share the first place with Lithuania’s Dalia Grybauskaite) and Romanian president Basescu, too, remains in his [last] place with his salary being only 335% of the national average income. Although in fourth place in the absolute ranking, Slovenian president Borut Pahor is now in the second last place – his otherwise upper-midrange salary (€ 5,419) is only 3.51 times more than the national average. 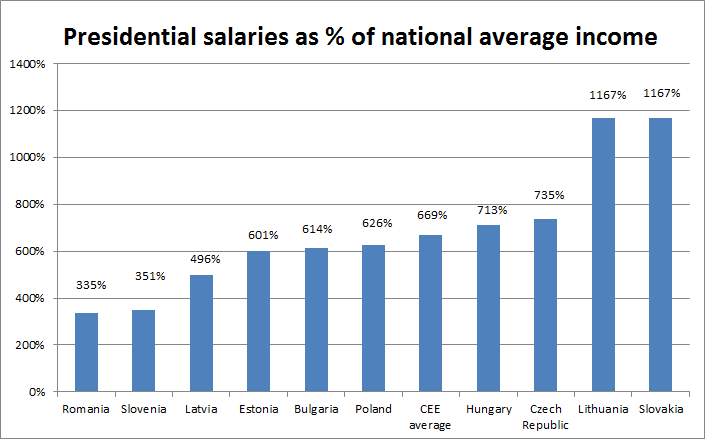 On the other hand, while Bulgarian president Plevneliev’s € 2,356 is less than half of his counterparts’ average income, it is still 614% of what his fellow citizens earn. On average, CEE presidents earn 667% of the national gross average income. Both bar charts do not necessarily suggest that a higher presidential salary is a function of a higher national gross average salary. Nevertheless, the scatter plot below shows that there is still a weak positive correlation (R=0.4187) between presidential salaries and the average income of their voters. Slovenia is the clear outlier – even before the 17% salary cut, the president earned considerably less than one could have expected from the national gross average income. What about power and elections? Another interesting point of comparison for presidential salaries are presidents’ actual powers and their mode of election. To start with the latter: popularly elected presidents earn more than their indirectly elected counterparts. 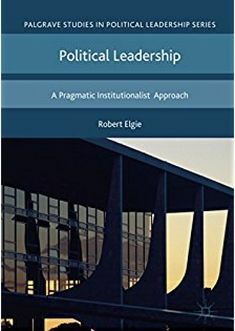 While the popularly elected heads of state in CEE earned € 5,375 (680% of the national average income), indirectly elected presidents earned € 4,519 (608% of the national average). Of course, there are only three indirectly elected presidents in the sample and the average would have looked a little different half a year ago when Vaclav Klaus was still the (indirectly elected) Czech president and earned up to €12,715 a month. Looking a the relation between presidents’ powers and their salary, there is no obvious direction. The correlation between the adjusted presidential salary (as % of national gross average income) and the score on Metcalf’s (2000) revised measurement scheme is only R=0.15. This post first appeared on presidentialactivism.com on 19 July 2013. This entry was posted in Bulgaria, Czech Republic, Estonia, Europe, Hungary, Latvia, Lithuania, Poland, Romania, Slovakia, Slovenia and tagged financial crisis, presidential income, presidential salary on August 19, 2014 by Philipp Köker.